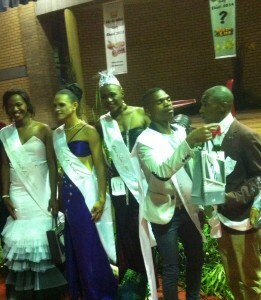 I was recently asked to be a judge at the Mr and Miss Gay Ekasi pageant organised by the Desmond Tutu Aids Foundation. You can imagine my excitement when I was asked to be a judge at the pageant. The competition took place at the Delft Community Hall in Delft. After giving the crowd a Queen Elizabeth wave as I was introduced as one of the judges, I took my seat and waited for the contestants to come on stage in their casual wear. When I arrived at the competition I was under the impression that Mr Gay would be women in drag, as in dressed up as men to compete for Mr Gay and the Miss Gay would be men in drag. To my surprise both the Mr and Miss contestants were men. I suppose the Mr “Gay” and Miss “Gay” tittle should have been the first clue, but that will teach me to assume the gendering of gay pageants. Although after the pageant I couldn’t help but think about whether there are any Mr and Miss Lesbian pageants? I don’t ever remember attending one, or hearing that it’s taking place, which brings up a number of questions about gender in LGBTI pageants. As soon as the competition began I realised that this was going to be a tough job, but I was ready and willing with my scoring sheets. The contestants strutted on stage trying to impress us in the second round with “wild life” themed outfits. The contestants came out in swimsuits and other “wild life” interpretations including what looked like goatskin. This round was followed by eveningwear, which was the last round the contestants could use to impress the judges. Throughout the competition the crowd was really not shy about whom they thought should win, and became more aggressive about it by getting closer to the stage towards the end of the completion. After much debate and deliberation we, the judges, chose the top five Miss Gay and top three Mr Gay and after questions and answers we came to a conclusion of who should win. The Mr and Miss Gay Ekasi pageant is community centred. It is an annual celebration of young LGBTI people who are living their lives, the best way they know how, under extremely harsh social conditions. In the participants I saw young people who are brave, who challenge their communities gender expectations and defining for themselves what it means to live free. In the participants I saw a determined spirit that I hope burns on in other areas of their lives. I was inspired to be in the company of black LGBTI people who are marvelling in each other’s presence. The energy in that Community Hall can’t be described it had to be felt. I am not new in the world of beauty pageants. My fascination with beauty pageants began in the mid 1990’s when I still a primary school going little boy. I used to watch Miss South Africa every year and then watch Miss Universe and then conclude the holy trinity of pageants with Miss World. I used to have a note pad and a pen and I would closely watch the scores and write them down so I could predict the winner. I became very good at predicting the winners because after watching religiously I picked up on the patterns of the competitions. I think maybe these were the first signs of my interest in social science. As I grew older and began to have a more nuanced understanding of the world, I began to see beauty pageants in a different light. Pageants are not divorced from the racialized ideas of beauty. The politics of apartheid ensured that black women were excluded from entering the national beauty pageant but after apartheid fell Jackie Mofokeng was crowned the first black Miss South Africa in 1993. The following year Basetsana Khumalo (Makgalemele back then) was named Miss Africa 1994. It is important to note that the black women who win Miss South Africa in the post-apartheid era are women who closely resemble white ideals of beauty. These ideals include slender figures, relaxed hair or hair extensions, etc. By saying this I am not condemning black women who choose to straighten their hair and wear weaves, but what I am saying is that beauty pageants seem to ONLY accept this style of black women to enter and win. This was largely replicated in the Mr and Miss Gay Ekasi pageant, although the woman who won Miss Gay Ekasi had a shaved head, which was refreshing for the judges. The racialized politics of beauty continue as we have seen with the crowning of Leah Kalanguka as Miss Uganda 2014/15 and the amount of abuse she has received because she is seen as “ugly.” On social media platforms Ugandans and other people have called Leah Kalanguka all kinds of derogatory names and have said that she does not deserve the crown because she is not beautiful. People often talk about beauty as if it is something that is “natural” but society is actively involved in the process of constructing beauty. The ways in which beauty is constructed in society, including African communities, does not take place outside of the notions of white supremacy. I would argue actually that current constructions of beauty are based on white supremacist foundations. We live in a world where black people are obsessed with “yellow bone” beauty. I have written about the white supremacist foundations of the term “yellow bone” and I think calling Leah Kalanguka “ugly” is a manifestation of “yellow bone” narratives. I don’t think Miss Uganda 2014/15 is “ugly” she has dark skin and it is her dark skin that people are equating with ugliness. In a world of “yellow bone” beauty, where beauty is measured by proximity to whiteness, of course people will find her “ugly.” The statements made by people on social media platforms about Leah Kalanguka do not shock me. This is not a surprising at all. Actually, sadly, it’s quite expected. This story about Miss Uganda speaks to the desperate need for black people to deprogram themselves of white supremacist notions of beauty. Although there are many platforms like magazines, books, websites, twitter accounts, Facebook pages that celebrate African beauty, the venomous colonial narratives of beauty persist. We live in postcolonial times on this continent, and post-apartheid in South Africa, and the possibilities of constructing African beauty according to our own ideals is infinite. As people who are working towards the realisation of an African Renaissance it would do us good to shed the limited conceptions of beauty, of love, of sexuality, of the good life, of success, of gender, of Africa-ness, left behind by colonialists. Achille Mbembe articulates quite successfully the essence of what we should be striving for when he states “we need to reopen Africa to the circulation of ideas and mobility, against models of post colonial, internalised boundaries.” We need to break the narrow confines with which we work with to define African beauty and identities.